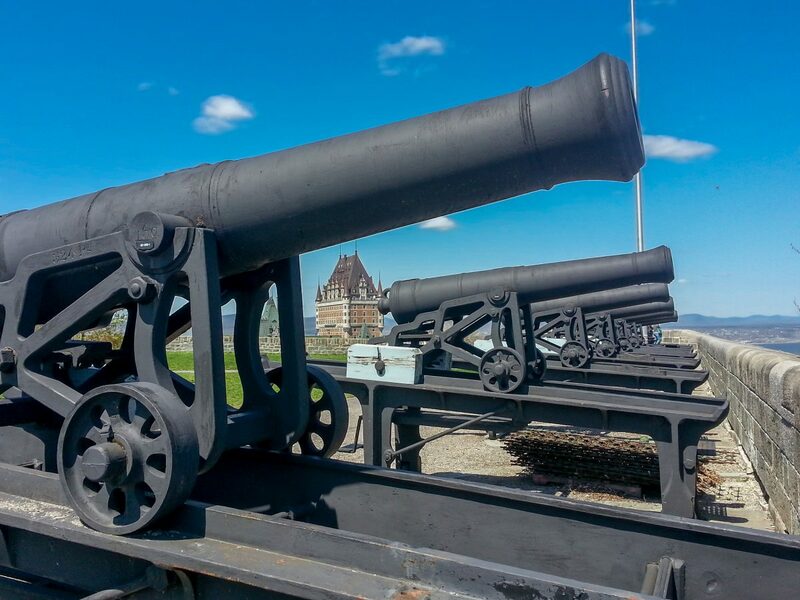 One of the oldest walled cities in North America, Québec City both charmed and inspired Marathon Club members last fall. 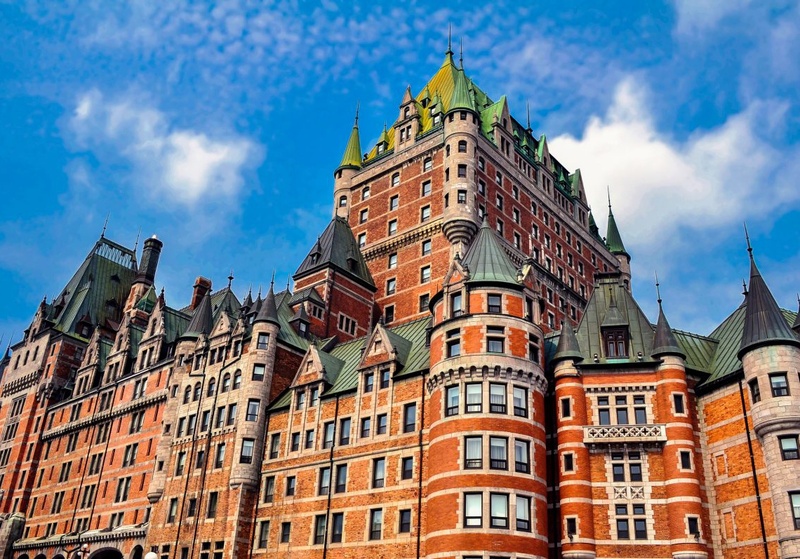 A bit of Europe in eastern Canada, this majestic city — built on the foundation of French culture and history — provided a stroll through the extraordinary with its food, architecture and overall “joie de vivre” (excitement about life). The September 14-19 rally began with scenic city tours lead by insightful guides who spoke perfect English with engaging French accents. Many attendees chose to commence their Canadian experience with a Québec City bus tour, while others favored taking either the Upper or Lower Town walking tour. 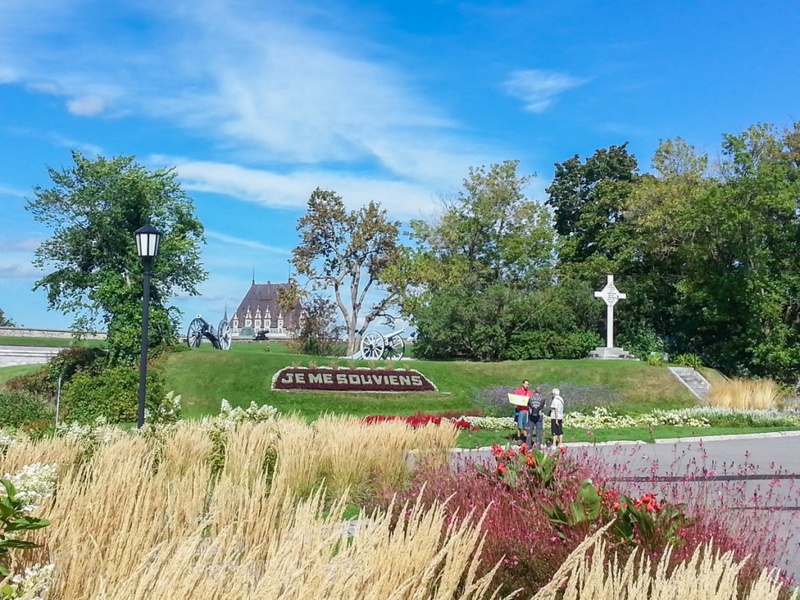 Those who chose the Upper Town tour visited: the historic Seminary of Québec, now occupied by Laval University’s School of Architecture, with its refined construction and closed courtyards; the Ursuline convent, the oldest educational institution for women in North America; Notre Dame de Québec Basilica; the governor’s residence and more. Another tour highlight was the visit to the Dufferin Terrace, the bustling boardwalk that overlooks the dazzling St. Lawrence River. 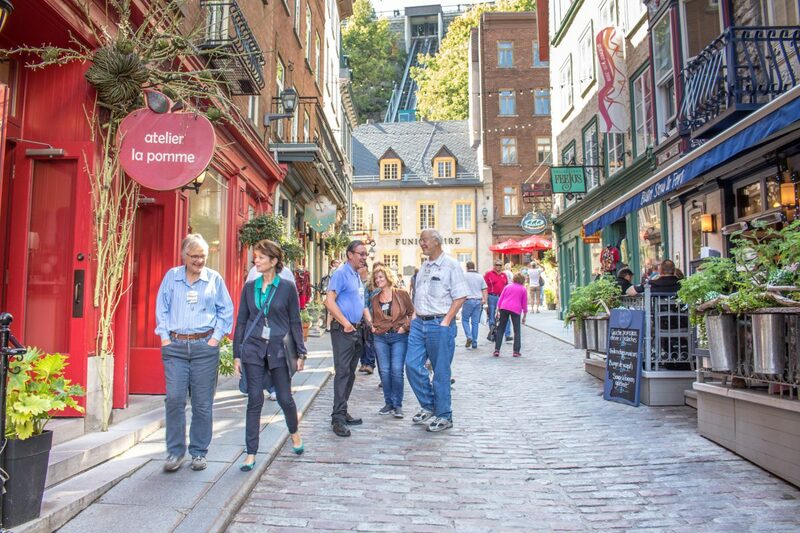 The Lower Town tour led attendees on winding cobblestone streets, between 400-year-old buildings where Québec City Founder Samuel de Champlain established his first trading post in 1608. It was easy to envision as a once humming port and trading center, though today it is filled with chic boutiques, cozy restaurants and inviting art galleries. Attendees also visited Notre Dame des Victoires Church, the colorful Mural of Québeckers, Place de Paris and popular St. Pierre Street. Monday evening, the 26 “First-Timers” and their “Buddies” headed for the unforgettable Chez Boulay Bistro Boréal for their private social of signature cocktails, group photos and merry-making. Soon after, the rest of the attendees arrived to enjoy first class libations and a five-course meal featuring Nordic cuisine. The bistro, known for its sustainable, gourmet food, did not disappoint: From the signature meat platter appetizer to the dessert duo of frozen maple and peppery green alder parfait and wild carrot seed cheesecake, the menu was creative, inspired and exquisite. After a night of rest and relaxation, the Club’s board of directors were up early Tuesday morning for their fall meeting, which was followed by the Club’s general business meeting. Here a variety of reports were presented, and voting took place for the Club’s next slate of officers and board members. Congratulations poured in for new Club President Kit Thomson, Vice-President Ken Byrtus and Secretary/Treasurer Carol Gossman. 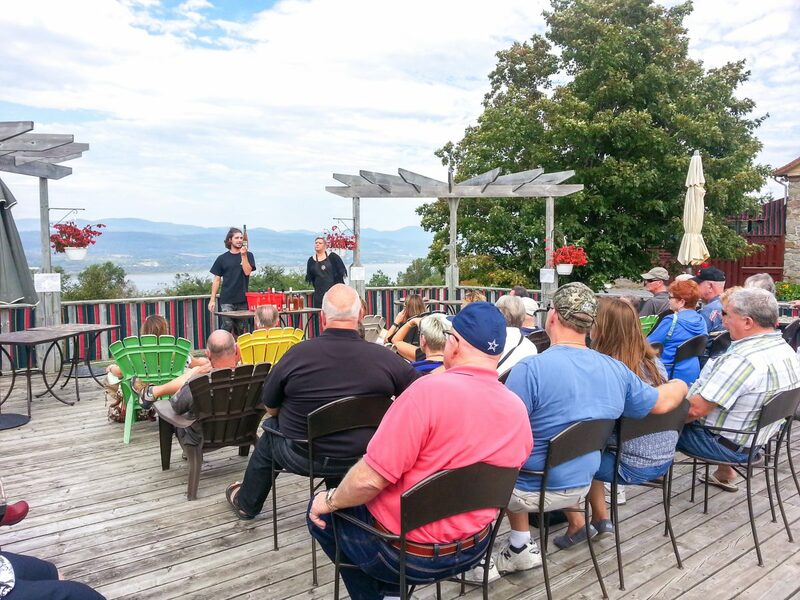 By 9:30 a.m., attendees gathered to learn about Québec City’s dramatic history from historian and author David Mendel. 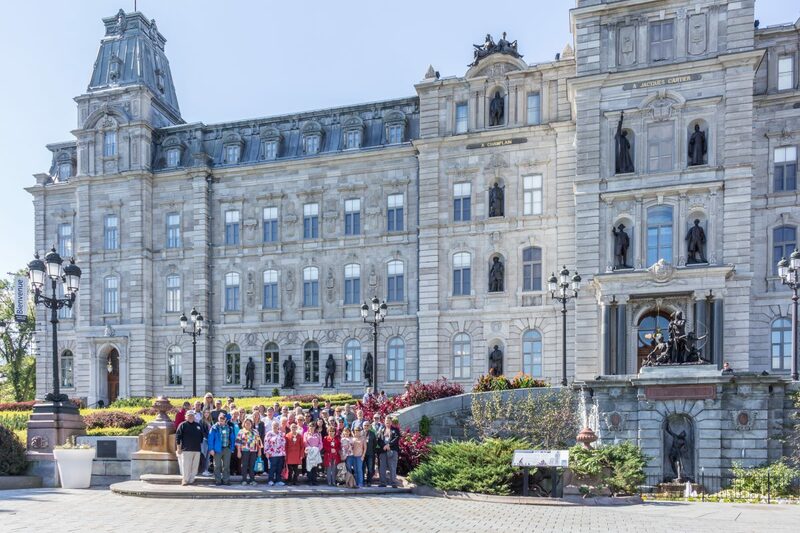 The group’s history education continued throughout the morning with the stunning Québec City Parliament building tour. 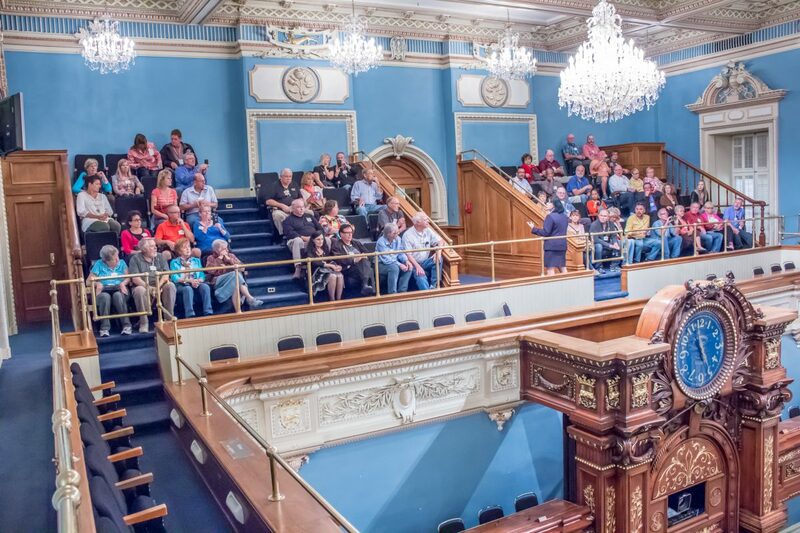 Completed in 1886, this designated historic site is the meeting place of Québec’s 125 elected representatives, the National Assembly and the lieutenant-governor. Lush, perfectly manicured gardens surrounded the impressive Parliament building, which is adorned by statues of significant historical figures. 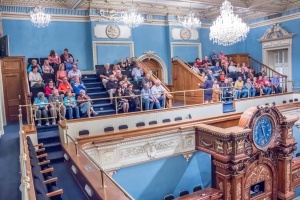 Inside, the education continued with explanations of 125 years of political history and the modern workings of the elected representatives as attendees traversed the sanctity of the historical halls and elegant Parliamentary Proceedings rooms. After the tour, attendees enjoyed a leisurely lunch at Le Parlementaire, which has been serving the best of the region’s flavors since 1917. With chefs known for seeking inspiration in the Parliament garden and area beehives, it’s no surprise that the food was delicious. Following afternoon tea, coffee and dessert, everyone was invigorated and ready to take walking tours in the sunshine. Soon after, the free evening brought a buzz of dinner plans with group reservations to the area’s best eateries growing larger and larger by the minute. Wednesday had everything to do with homecoming. Heading to the Prevost factory in Sainte-Claire for a private tour and lunch, attendees were able to see the bus manufacturer’s mission in motion. 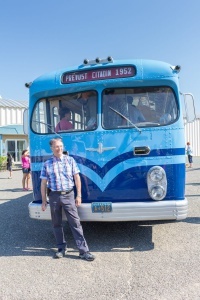 With multiple tour leaders, including Rene Prevost, grandson of the founder, attendees were able to see the development of the unparalleled luxury coach conversion shell. Overbuilt to withstand the rigors of constant mass transportation, yet built specifically for the RV lifestyle, the group saw the building process in action, asked the experts questions and discussed Prevost’s plans for the future. Before lunch was served, many attendees walked through the refurbished, 1952 Prevost passenger coach that was on display. Some Marathon Club members stayed for the technical seminar while others left for a tour of the National Museum of Fine Arts of Québec. Aside from their vast house collection, the museum featured a special collection “Looking East,” which celebrated the influences of Japanese art and culture of Western artists, including Monet, Munch, Van Gogh, Degas and Matisse. 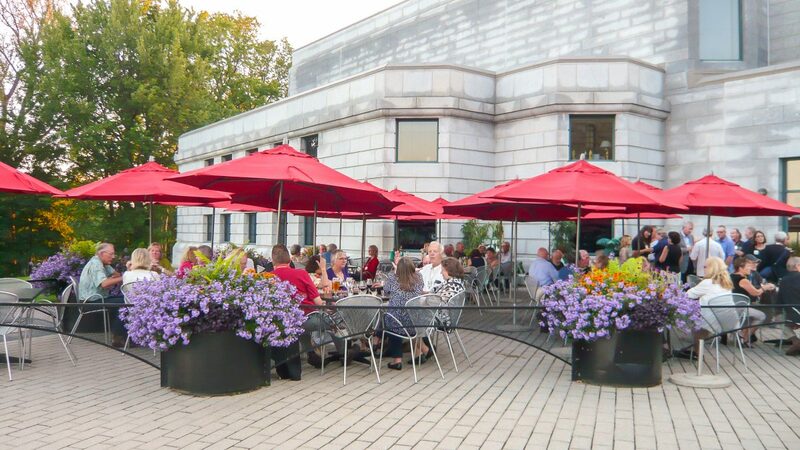 Sun-soaked rolling hills provided a lovely backdrop for the social on the museum’s patio. People mingled, snapped photos and settled in to enjoy delectable appetizers and drinks. After a gorgeous sunset rolled lazily out of sight, attendees gathered inside the Restaurant Du Musée to sample the culinary creations of head chef Marie-Chantal Lepage. With selections such as beef tenderloin and marinated lobster tail with potato gratin and tuna block with creamy risotto, it’s no surprise that the four-course, gourmet meal elicited a round of applause for the self-taught, talented chef. The green tea crème brûlée and perfect macaroon ended the night on a very sweet note. 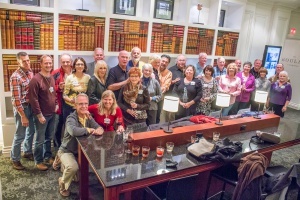 Thursday morning brought attendees their choice between touring the nearby Island of Orleans or attending a whisky seminar in the city at an authentic Irish Pub. The group then moved on to Domaine Steinbach, where they enjoyed ice cider on the terrace overlooking the family orchard and the St. Lawrence River. After moving inside to sample their authentic farm delicacies — ciders, vinegars, pâté, mustards, jellies and jams — many shopped at the onsite store. Those who chose the whisky tour journeyed to Galway, Ireland via the popular Pub Galway located in the heart of Québec City. Proprietor Yves Ledoux provided samples of exclusive whiskies from around the world, while leading attendees through the process of inspecting color, nosing, tasting and experiencing the residual. And, of course, there was lunch — a spirited menu of rich, down-home food with Irish touches. After a brief reprieve back at their coaches, attendees headed for the Fairmont Le Château Frontenac. 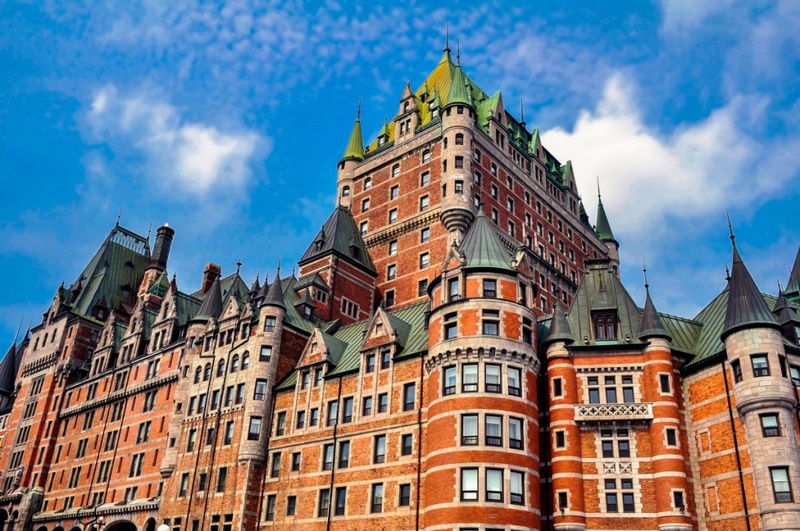 Opened in 1893, this hotel was designated a National Historic Site of Canada in 1980 and holds the distinction of the most photographed hotel in the world. Music and merriment rang from the Beauharnoirs Room with the clink of cocktail glasses and sparkling conversation. Soon after, dinner followed in the Montmagny Room, where Prevost President Gaétan Bolduc and wife Marlene joined the party. From the first course of truffle-oil risotto and roasted scallop to the last course of maple fondant, custard and wild blueberries, the evening at the Château was nothing short of magnificent. 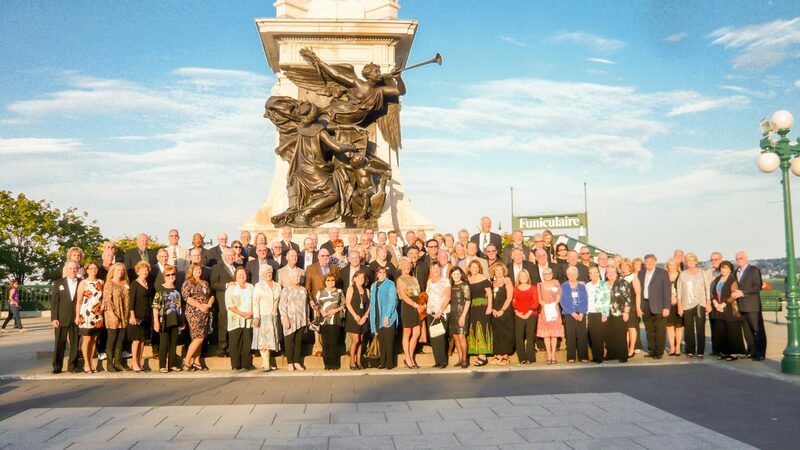 The group reunited in midafternoon for a VIP tour of La Citadelle de Québec, an active military installation and the official residence of the Canadian monarch and the governor general. After a brief visit with some military members, tour guides donned in period costumes, with character to spare, shared hundreds of years of history during this fascinating tour. The rally’s final evening was hosted by Prevost at the Hôtel Musée Premières Nations, where Aboriginal traditions and modern luxuries blended beautifully. The Huron-Wendat Nation at Wendake is a self-governing territory in the depths of Québec City. Because the culture is matriarchal, the Longhouse experience featured a female tribe elder, who took the attendees back to 1534, before the Europeans made their way to this land. As the rhythm of songs and drums surrounded all, she explained the Wendat culture through current day. After burning the four sacred herbs of the Wendat nations and a Labrador tea service, the social took place in the Huron-Wendake Museum, followed by dinner on-site at La Traite restaurant. This eatery featurers Huron-Wendat inspired dishes that are locally hunted, fished and gathered. The evening ended with a traditional dance and drum show. 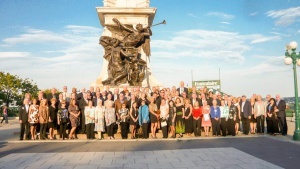 “The social and dinner at Hôtel Musée Premières Nations was lovely,” said Sandy Kincaid. “The ambience was beautiful and the food fabulous! This rally was exceptionally fun; it was filled with so much history, the architecture was gorgeous, the weather was beautiful, and as always, we got to visit with wonderful friends! We really, really, really enjoyed it!” Thank you to Prevost for its unwavering support, to Marathon for their continued backing, to the Rally Committee and to everyone involved in creating such a unique and memorable experience. As departure time was nigh, Pat Burckard summed it up flawlessly. “This rally was wonderful,” said Pat. “There were so many exciting places to visit and see in the city; however, I was most excited about seeing all our special Marathon friends!” Until we see you again, happy adventuring.